Sartorially speaking, it is interesting to see how Bourne adapts the same clothing he wore while working out in Goa (a very hot environment) to arriving in an Italian sea port in the middle of winter (a very cold environment). After a restless evening spent of nightmares and bad memories, Bourne is up and active early the next morning, running down the beach in Goa. His clothing isn’t practical for running, at least not in the traditional sense. However, as we are used to seeing Bourne outwit trained enemies while wearing a heavy trench coat and a sweater, the T-shirt and shorts option is probably a welcome break for him. Matt Damon is completely airborne in this shot. Neato. The T-shirt is a faded blue lightweight short-sleeve with a charcoal tint, likely from American Apparel or H&M. As he runs in the Indian sun, his sweat drenches it, making it appear darker and greener. However, once it dries, it is clearly blue in color. Production photos also verify this. As mentioned, his khaki cargo shorts are not practical for running. Of course, Bourne has to be ready at a moment’s notice for anything, and so the shorts with pockets are probably a better choice than most athletic shorts which have limited, if any, pocket space. Bourne is also in much better shape than the average man and cargo shorts wouldn’t be an impediment. Keep this in mind the next time you putting off going to the gym because “All of my gym clothes are in the laundry and there’s a Matlock marathon on TV.” Spoiler alert: Matlock wins the case. The person in the turban is probably mad jealous of Damon right here. On his feet, Bourne also ditches specific practicality for general practicality by wearing his usual brown Timberland Euro Hiker boots and white athletic socks, stained gray by his sweat. These come into handy when Bourne spots a threat and has to go on the run through various terrains, requiring firm shoes rather than running shoes. Also, the Euro Hikers are tougher and more durable in the conditions Bourne runs through. Perhaps the least practical item of all is the beautiful TAG Heuer watch we have come to know and love. I hardly ever wear a watch when working out, but when I do, it’s usually a $20 digital Timex. I guess world-traveling badass government assassins can afford the risk of wearing a $2,500 Swiss watch when running in 100 degree heat on a beach. It really is a very nice watch. After spotting his threat, Bourne decides he has to leave – now. He gets back to his bungalow and, unseen but assumedly, switches from his shorts into a pair of similar-colored lightweight khaki slacks with two large patch pockets in the back. Although the pants have belt loops, he – as usual – doesn’t wear a belt. On the rear of the pants is a metallic clasp, possibly for an elastic belt. 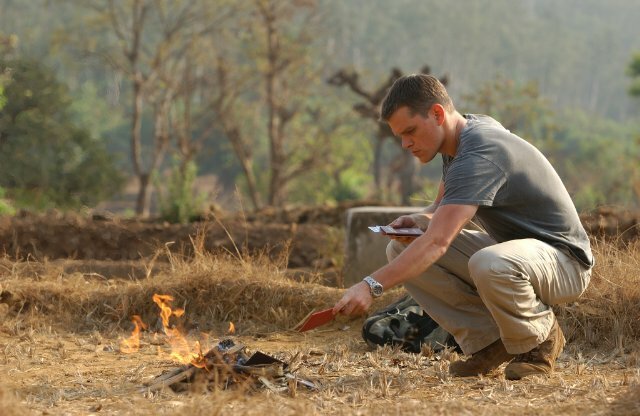 Although he frantically rushes through the house to pack up the passports and cash, Bourne takes about ten hours to burn Marie’s things. Now totally compromised (and alone), Bourne has to make quick tracks out of India to a place of relative safety. He quickly packs up his most necessary belongings (guns, money, and passports – the usual), possibly to make up for the snail-like pace at which he burned Marie’s possessions. He heads out the door with a duffel bag and a 9 mm Beretta in his waistband. When we see him arriving in a chilly Italian port, Bourne is now wearing the exact same clothing, with one addition to fight the colder sea breeze: a fraying dark gray wool sweater. 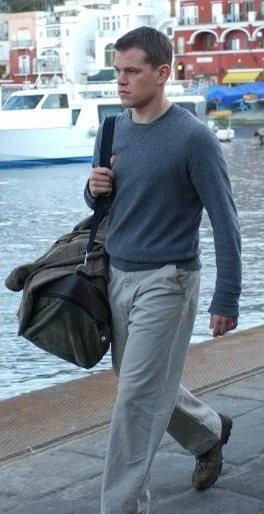 The shot parallels Bourne’s arrival in the first film, Bourne stands towards the bow of a ship, wearing a torn sweater over a T-shirt and unsure of what he’ll be going up against. Gosh. I wonder if they did that on purpose? A jacket may have been a more practical choice, but Bourne may recognize its impediment when engaging in close quarters combat – as he does upon his detainment in the U.S. Consulate office. Why would the guy even try to take down Bourne? Didn’t he see the first movie? Moron. Bourne isn’t just some slob who happened to be chased out of India. He was always prepared and ready should the day come. Despite saying he got “lazy”, Bourne is still in top physical shape, the result of running down the beach every morning. He follows up his workout with a bottle of water. To get yourself in Bourne mode while running, listen to the first few tracks of The Bourne Supremacy‘s excellent soundtrack, composed by John Powell. Both “Goa” and “The Drop” are appropriate for jogging on an Indian beach. Once you’ve got that covered, grab your Beretta, your backup passports and cash, and your Siemens ME45 cell phone, and pack it all in an olive drab duffel bag with black straps. If you’re beat up ’92 Suzuki SUV isn’t starting, now’s your excuse to hotwire a BMW. This is all very easy, basic stuff to put together, except, of course, for the $2,500 watch. While making their escape (or attempted escape) in the Suzuki SUV in India, Bourne pulls a Beretta 92SB out of the glove compartment, checks the magazine, and prepares to take it with him. Most people are familiar with the later variant of the Beretta 92-series, the 92FS, made famous by Bruce Willis in Die Hard and Mel Gibson in Lethal Weapon, but the 92SB was an earlier version, developed in the early 1980s for the U.S. Air Force pistol trials. 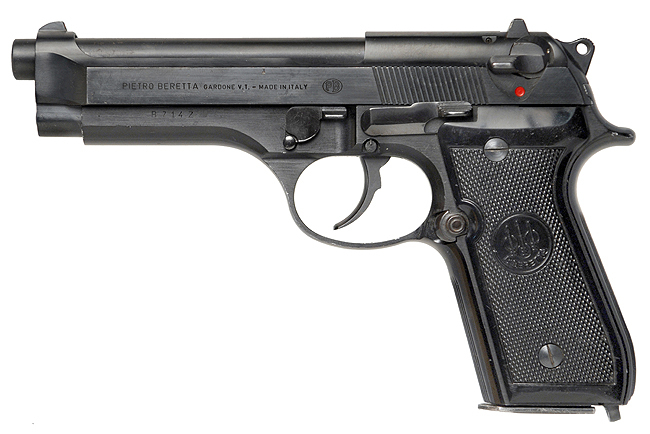 The Beretta 92SB, predecessor to the more popular 92FS. The 92SB and 92FS are practically similar in every way, both being double-action recoil-operated semi-automatic pistols with a standard 15-round magazine of 9×19 mm Parabellum ammunition. The only really noticeable difference is that the older 92SB has a curved trigger guard, compared to the squared trigger guard on the 92FS for easier aiming. Bourne checks the magazine of his 92SB. Despite the 92FS’s more widespread popularity, notably replacing the venerable .45-caliber M1911A1 as the U.S. military’s standard sidearm and filling the armories of major police departments like the LAPD, the 92SB still found great use in films. In addition to being seen in Bourne’s hands in The Bourne Supremacy, the character Paz carries a 92SB in the follow-up, The Bourne Ultimatum. I told them what would happen if they didn’t leave us alone.